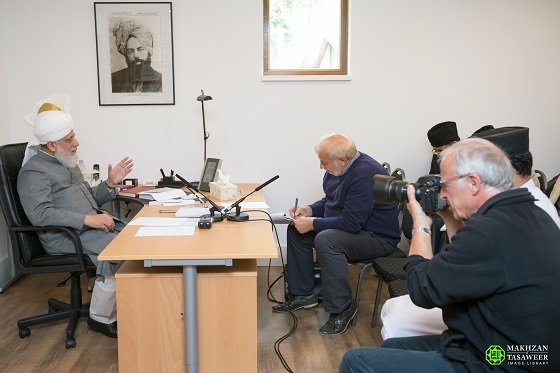 Hazrat Mirza Masroor Ahmad makes remarks during interview with Dutch newspaper De Stentor. On 7 October 2015, the World Head of the Ahmadiyya Muslim Community, the Fifth Khalifa (Caliph), His Holiness, Hazrat Mirza Masroor Ahmad was interviewed by the Dutch newspaper De Stentor at the Baitun Noor Mosque complex in Nunspeet, Holland.During the interview, His Holiness spoke of his fear that the world was moving towards another world war. He said his message to all nations was simply to “be sensible” and to seek peace. Share the post "“Our mission is to spread the true and peaceful teachings of Islam”"